The outside world may be in freefall, but inside Disney Hall, I feel no worries. Violinist Hilary Hahn just walked onstage, regal and steady, copper gown glittering in the stage light, still not a line in her young face. She's playing the Glazunov Violin Concerto with the Los Angeles Philharmonic, and from note one, she plays with unfaltering tone, solid and controlled. Her effort is generous, without being labored. When the orchestra drops out for her cadenza, she holds her audience rapt, keeping the melody always at the forefront, embedded in perfectly in-tune double stops. During the last movement, the orchestra, with conductor Leonard Slatkin keeping the whole endeavor well in sync, is a wave, and she just rides her technique. It's a joy ride, too. For an encore she plays the Sarabanda from Bach's D minor Partita. 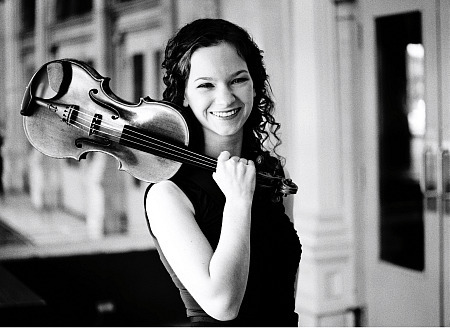 It's a busy week for Hilary Hahn; she is up for two Grammys this Sunday, for her recording of the Schoenberg and Sibelius Concertos that she did with Esa-Pekka Salonen and the Swedish Radio Symphony Orchestra. It's a piece she discussed with us at V.com several years ago, right after she had recorded it. On Friday she will play the world premiere of Jennifer Higdon's Violin Concerto, a piece that was sitting on her music stand, backstage at Disney Hall, when I spoke with her after her performance of the Glazunov last Saturday. We talked about the Higdon premiere and new music, about violin cases and the economy. Laurie: Tell me a little bit about this concerto that you'll be premiering; I understand that Jennifer Higdon wrote it for you. How did it come to be? Hilary: I was (Jennifer Higdon's) student at Curtis in her 20th century music history class – it was still 1990-something at the time. So Jennifer Higdon basically introduced me to my attitude towards the whole body of work from the 20th century – she got me familiar with everything in that whole group of pieces. Every week she would focus on one or two composers. We had two classes a week, and in each class she would play the music all class and write facts up on the board. We were never tested on the facts of the composers; we were tested more on how well we absorbed what we were listening to. The tests weren't nerve-wracking; she would ask us compose a theme in the style of one of the composers we'd been listening to, one that really resonated with us. Or, if we were studying percussion one month, she'd ask us to write a piece for percussion, no longer than three minutes, and perform it in class. It was probably the lowest "fact" class that I've taken, and the highest "content," because when we were listening, we could form our own opinions. We also talked about what we were listening to, as we heard it. If anyone had any questions, we could raise our hands. If there was a particular element, compositional style, or a particular unique aspect of a certain piece, she would point it out as it appeared in the music, as we were listening. Being exposed to this music by a composer was liberating and eye-opening at the same time. So I had that history with her: that was the first time I was in her musical world for an extended period of time. Then I did a piece by (Higdon) with some friends of mine at Curtis, called Dark Wood. It was for bassoon and piano trio. That was probably the first piece of new chamber music I'd played in which I knew the person who had written it. Laurie: Did that give you a taste for doing new music? Hilary: Well, I'd already done new music, but I hadn't done pieces where the composer was right there. That actually wound up being the premiere of that piece, because there was a group that was supposed to premiere it a couple weeks before but they canceled. So we inadvertently played the premiere, it was really neat. Laurie: What is Higdon's new violin concerto like? Hilary: I would say that this violin concerto pushes the instrument a fair amount, and it slightly pushes the concept of line and melody. The way the melodies are broken up is a little bit similar to Schoenberg. People won't hear it at all as sounding like Schoenberg, but it's a little bit similar in the sense that a lot melodies that would normally be on one melodic line are staggered. So you have two, maybe three, going at once. And in Schoenberg they call them tone rows, but to me, when I hear Schoenberg, I hear multiple voices, alternating with each other. That's the effect that I hear in her music, although you wouldn't call it a tone row. Laurie: Did she consult with you at all for this piece? Was she writing it for your style? Hilary: Well, she was writing it for me, and she asked me a couple things. Early on, I noticed she was asking me about what was doable, whether this was possible or not, because she's not a violinist and she wanted something that really worked. Some people she'd worked with before had told her that things she was writing were not going to be so effective for that particular instrument. I think that's wrong, though, because all the things she was asking me to do, they were all very doable. So I told her: Don't ask me, just do it. Do anything you want to do, and we'll worry later about whether it's playable on the violin or not. She wasn't being tentative, she was just being very conscientious about it. I like it when composers write whatever is in their head, without worrying about that particular instrument, or about that particular musician. The composer may have that musician's sound in mind; then they should write what they're inspired to write, just total liberation. I wanted her to do that. That's why I say that she pushes the instrument a little, because she did do that. She wound up writing things that are different from what existed before, that have a unique kind of language. Of course, her signature gift of rhythm goes all the way through the piece. In some pieces there's a lot of rhythmic deviation, a lot of drive, and it's hard to put together. But this one, it falls right into place. The individual lines might seem like they wouldn't fit, but then you play it all together and it's really just lock-step, and not in a stiff way. It just all comes together really well. That bodes well for the future of the piece, for being able to get people to put it together effectively and quickly. Laurie: Maybe that's the mark of a good composition, that it's crafted in a way that it just comes together. Hilary: I think it should come together in the end interpretively, and that it should come together in the end ensemble-wise; but I think it's okay if the musicians have to work for that. I don't think a composer should write for ease of assembly, or ease of listening. Laurie: That's something I wanted to ask you about. The Schoenberg concerto certainly isn't the easiest piece to listen to. Where do you see that line, between connecting with the listener, and doing something artistic? Hilary: It's the performer's job to bring the music across. A lot of the pieces that we love, that are considered standard, that are considered absolutely gorgeous, were not heard openly in the beginning, because they were something new. I think when composers write for the purpose of being accessible, they lose a lot of their own purpose for existence in the whole line of musical development. If they write what's in their heads, and in their bodies, what's running through their blood, and it happens to be accessible, that's fine. But I don't think anyone should ever edit themselves as a composer or a creator of something – for an audience, or for a performer. I think that really minimizes their contribution. Often the things that are strangest to us are the things that are most defining in the history of music. It's also the same in pop and rock music; the people who do really far-out-there things wind up being incredibly influential later on. It's the performer's job to take those things and bring them across to the audience. Why are we here as performers? If interpretation weren't part of it, then we wouldn't be necessary. Hilary: There's a whole sweep of it that happens, live, and people get caught up in it, in the audience. The musicians on stage are into it, too. The recording is probably better than what you would hear in any live concert. Live, we put less time into it. We put a lot of time into the recording. Not just the sessions, but everyone in the orchestra was practicing backstage, and at every break that they had. We had a lot of dedication, and I think it turned out really well. But to hear it live, to be with the other people in the hall, and to see people playing it, I think that could make a big difference for a listener. Laurie: One of our V.com members wanted to know if you have any future plans to collaborate with Chris Thile. Laurie: They want you to do the Ehrkonig. Hilary: That will probably happen at some point. If enough people are just clamoring for something to happen, people take note. Probably more likely for collaborations on record would be Josh Ritter. But people have to realize, when you have a record company (agreement), you have restrictions on what you can release. So if it were up to me, I would do a lot of other stuff. But if it's up to my exclusivity agreement, then I am barred from doing these things. People are all excited about certain projects, and I am, too, but sometimes I just can't do them at a certain time. So if something doesn't happen, it doesn't mean I'm not interested. Sometimes it's just logistical, sometimes it's scheduling. For example, for my next CD: Trying to schedule the Bach Aria album sessions, with Matthias Goerne and Christine Schäfer, and the orchestra, and all the continuo players – was so hard! We finally managed to make it happen. We have one more session, another couple things coming up in April, then it will be out sometime after that. Laurie: On another important topic, are you aware that your violin case is Twittering on your behalf? Hilary: I have heard rumors of this! I don't know what it's saying. Laurie: Now, is this truly your violin case, or is it an imposter? Hilary: You know, I gave it my Twitter password, and I think it went and set up an account. My violin case has insider info that no one else has. Laurie: What kind of violin case do you have? Hilary: The case is a Bobelock. Laurie: It looks like it has sort of a wine-colored interior. Hilary: It's a Hermes scarf; I knew it would be high-quality silk. I had someone make it. I got the new case because my other case was falling apart, I had it for 15 years. It's very difficult to find a case. People should be very careful when they buy cases to test every single aspect , especially if you're going to be taking it out of the house. When you're in the store, there are things you should check: You should put it down at waist level, put your hands on the top, and bounce with your body weight a little bit. That will tell you a lot. If it gives, no go. Then you take it and you open it, and you torque the two halves at a diagonal. If it bends too much, no go. When you close it, you push in on the sides, as hard as you can, and if they give, no go! You want a material that's not going to melt, too. On my previous case, I have a little round dot of melted synthetic canvas, because in the overheard compartments on airplanes, sometimes the reading lights are right underneath the floor. So when you're putting your violin up top somewhere, feel the bottom of the compartment, where your violin is going to be resting, and make sure there aren't hot spots. Sometimes the heating units go through there, so make sure there aren't cold air conditioning fans blowing on it. This is true in a train as well. You can tell a lot just by patting where your violin is going to be. If there is a temperature deviation, put something down between, like a blanket or a coat, and put your violin on top of that. Laurie: You wrote a blog about the state of the economy back in late November. What are your thoughts about the economy and the arts these days? Hilary: I think everyone's facing the same thing. I have a friend who's a filmmaker who said a lot of his friends have no work at all. There's always the debate with music organizations: Do you do fewer concerts? Do you do the same number of concerts for less? Do you ask the musicians to help out? If you ask musicians to do things for free, does it set up a precedent? Historically, with soloists, presenters will often negotiate a lower fee, and then say that will have no bearing on the next negotiation. But then when you come back, they quote the earlier fee and do a proportionate negotiation. So people want to help each other out, but they are wary of precedent. I think that goes with the orchestras as well. There's probably a lot of misunderstanding...Musicians want to blame the administration, they want to blame other people, but the administration keeps people going. They're trying to save the organization, and their jobs are on the line. They're taking pay cuts, too. So it's really hard for everyone. A lot of soloists are being asked to reduce fees, and a lot would gladly do it. I think some people may be canceling concerts. But I haven't heard of a lot of people losing jobs; I think that's a good sign. I think the arts have had to fight for survival so much that this is not coming out of the blue for us. We're used to seeing public funding in the States get cut. We've already developed ways we deal with that. In Europe, now, they're having problems because a lot of those organizations are still government-funded, and in some countries they don't have the experience of going to the private sector. They don't have a tradition of fund raising, and right now is a bad time to start! So I think we all appreciate the people who have been involved and who continue to be involved. If people just continue to help out if they can, even if they have less, we'll be all right. They don't have to contribute the same amount, they can contribute less, but it's just nice to see people continue to support and continue to care. That's the most important thing, because that means that when things start to look up, everything will be okay again. I'm not so worried. It's a little bit hard to panic, when you've been in panic mode, or around panic mode, for 20 years. I've been hearing how bad things are since I started playing the violin. People have talked about the death of classical music, that classical music is fading, that there are only white-haired people in the audience, that if we're not careful we won't ever have funding again, that orchestras are shutting down right and left. And that was 15-20 years ago. That's when I came into awareness of classical music as a career. So, maybe for people who began in the "heyday" it's different, but me, I've just been around this all the time. It's shocking to see it elsewhere (in the economy), that's what surprises me. There are a lot of fields, a lot of professions, where there was no concern at all (for the sustainability of the profession). I think we're going to see a reflection of what's going on in the greater society, but I don't think it's going to be worse for us than it is for anyone else, and I don't think that we're unprepared. I think we're very well-prepared. Great interview. She comes across as such a smart and perceptive person. And I really do hope she ends up releasing the Erlkönig. Great interview, Laurie. It covers so many diverse and interesting topics-- her dicussion of what to look for in a violin case is very useful. The Higdon premiere is with the ISO, where Zach dePue is concertmaster. Last year Time for Three, an ensemble in which Zach plays violin, premiered her triple concerto, written for them, with the Philadelphia Orchestra. 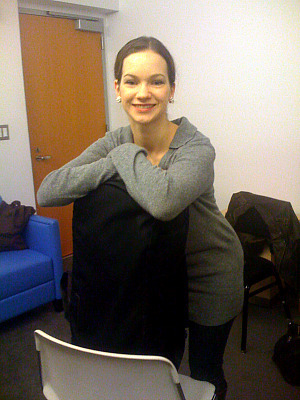 We heard Hilary Hahn play Dark Wood at an alumni concert at Curtis a few years ago, where Jennifer was in attendance. Having interviewed Jennifer Higdon a few times while she was writing Hilary's concerto, I am very curious to eventually hear it. Here we go again, recording companies *getting in the way* of the arts instead of furthering them. The sooner recording companies become what the name actually suggests (making recordings and leave the artists in charge) the better. This was my favorite interview done on Violinst.com so far. I can really see the spark you get out of doing interviews with Hilary. She provides so much knowledge.. She can truly only go up from here. Very interesting interview - the Higdon sounds like a "must hear" piece. Also great advice about putting the violin case in the overhead compartment of planes/trains! I'd never thought about that posing a danger of heat and will check it out next time I am travelling. Her instructions on how to test out a case are brilliant too. I have to say that I hope that one day Hilary will follow Gil Shaham's lead and set up her very own recording label for herself and her preferred musical collaborators, I think that would be a shrewd career and musical move and very popular amongst all her many fans. Once again, excellent work by Laurie!! More interviews please! I would love to hear both the Schoenberg and Higdon concerto live! She's gripping the neck of her violin like a baseball bat. Interesting. Another fine interview - thanks to Hilary and Laurie! We are seeing her recital in Thomasville, GA on 2/17...can't wait! "set up her very own recording label for herself and her preferred musical collaborators"
not only Hilary Hahn, all musicians should self publish. Recording companies should never ever have a say what an artist wants to release and they should certainly never own the rights to the intellectual property which is the instrument by which they enslave artists. Thanks for the great interview! I can't wait for the new bach cd to be released. I have the Schoenberg and her Paganini Spohr but I love the Mozart Sonatas with Natalie Zhu. I must admit I am relatively new to the world of classical music, having re-taken up the violin a couple years ago but Hilary Hahn was one of the first violinists I was exposed to as I started trying to learn what is out there. I have been a fan right from the get go! Wonderful interview Laurie! I thought Hilary mentioned in her blog that she was recording the Tchaikovsky ....no mention of it though, did it not happen? I saw her play it recently in San Francisco and it was a revelation. Who knew it was really a chamber piece? I was on the edge of my seat the whole time and it seemed like much of the audience was too. So was it a chamber piece for violin, orchestra, and audience? John, I also just started back on the violin a couple years back, and one of the first pieces I listened to was Hilary's recording of the Barber. By the time the 3rd movement came along I said to myself "OMFG" and my passion for the violin was kickstarted again. No matter how good the recordings are, you have to see her live! Thanks so much again for asking Hilary my question. If you are near Indianapolis, there are still tickets left for both the Friday and Saturday performances of Hilary Hahn's premiere of Jennifer Higdon's concerto with the Indianapolis Symphony Orchestra! That was nice! So many simple, uncomplex things that I learned and I keep saying to myself, "Man, how is it that I miss these things?" She speaks on everyones level and is a joy reading as she is to listen too....IMHO. PS: Paul G- When you post you remind me of her in so many ways. Ways that I mentioned above. I realy mean this. I hope that you will post your playing of something here some day. Thanks, Laurie. That was a great interview. I look forward to hearing her perform the new concerto. I am going to see HH later this month an Akron with Valentina Lusitska. She is also doing the Higdon in Baltimore in early June. Hi Royce, I'm sorry, I didn't even see this till now. And thanks. Being compared to Hilary Hahn in some way? WOW. I'm still working on Adagio from the G minor sonata, and it's crunch time because Thursday I have to perform it in front of my class and the recital is the 26th or 27th this month. So after the recital is done with, I'll get the audio recorded and posted as soon as possible! I've just got a huge list of things between school and music to do, so things keep getting delayed and pushed back further and further. But I will get it done eventually!